We have a LOT of Swiss Chard growing in our garden! There is only so much cooked greens that one can eat (at least that I can eat), so I’ve been trying to think of other ways to use it. Last night, when it was cooler, I made a tasty frittata and plan to reheat slices in the microwave for breakfast or lunch throughout the week. Preheat oven to 350°F and position the top rack to the highest level for broiling. Heat oil in a large nonstick skillet over low heat. Add onion to skillet and sauté until caramelized/golden brown, about 15 minutes. Increase the heat to medium; add sausage and sauté until brown and cooked through, about 5 minutes. Add the Swiss chard and sauté about 2 minutes. Drain any extra liquid off and cool mixture. In large bowl, whisk eggs, cream, salt, and pepper. Add the chard/sausage mixture, then Parmesan and feta; stir to blend. On Medium heat, melt butter in skillet (do not let butter become brown) and then add egg mixture. Turn the heat to low, let the eggs thicken slightly then place in oven and cook until only the top surface is slightly runny. Move the pan to the top rack and broil for 5-7minutes until top is slightly browned. 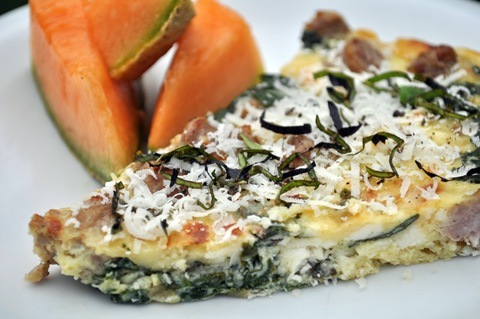 Cool frittata 10 minutes to set before serving. Can be refrigerated and reheated or eaten cold whichever you prefer. Top with fresh basil or parsley. In addition to adding the chard to salads, I think we'll make a few pasta or pizza recipes in the coming weeks. Do you have a favorite way to eat Swiss Chard or recipe to share? I'd love to hear about it! Submitted by amm0377 on Sat, 07/30/2011 - 20:02. Your favorite noodles we like the Quinoa noodle for this one because Popeye loves protien. Cook lentils, drain, and set aside. Cook chard, drain, and set aside. Saute garlic in about 2 T of olive oil. Add Italian seasoning and saute for about 1 min. add tomatoes and tomato paste. Simmer for 15 min. Stir in lentils and chard simmer 15 more min. I think that is it. I cook alot by feel and what we have so it varies from time to time. Submitted by adminX30 on Tue, 08/02/2011 - 19:46. I love how simple this sounds to make and can't wait to taste it! Another great way to use our chard! Submitted by amm0377 on Sat, 07/30/2011 - 19:37.
i just make sure to keep some cleaned and chopped in the fridge so I can throught it in anything. Spagetti sauce, eggs, wilted in salads, both lettuce and grain, chili, and tonight in stuffed zucchini. Submitted by adminX30 on Tue, 08/02/2011 - 19:44. Love the idea! I'm going to give it a try. Thanks! !